With a big, bold preamp and the flexibility of variable Silk/Texture, Rupert Neve designed the 511 to combine classic sonics with 500-series value. Incorporating the 517s powerful preamp, the 5012s universally useful sweepable high pass filter, and the transformer-saturating power of a variable silk circuit derived from our flagship Portico II Channel, the 511 is a Rupert Neve-designed micpre for the masses. Designed for 500 Series by Mr.
Rupert Neve: While creating functional 500 series modules is relatively simple, designing those modules to equal their non-500 series counterparts with the current, voltage and space restraints is quite challenging. In creating our Portico 500-Series Modules, we experimented with a number of different transformer and circuit designs to achieve the same presence and sweetness found in the Portico Series of modules. The result of these efforts is that outside of the slightly lowered headroom, our 500 series modules are nearly indistinguishable from standard Portico Series modules, and are perfectly suited for studios of the highest caliber. Input signals may be derived from Mic or Line sources make sure 48V is off for line sources! The input has a 10K non-reactive input resistance that handles a full 22dBu signal without the need for a pad. The pre-amp is a TLA non-reactive design that precludes the loading of microphones with limited driving capability. A primary gain control provides 66dB of gain in 6dB increments for easy recall, with a +/- 6dB trim for fine adjustment. For condenser microphones and powered DIs, there is +48V phantom power. A transient-optimized HPF continuously covering the range from 20-250Hz is included to tame rumble and proximity effect. One of the key developments in the 511 is the Red Silk / Texture control from the Portico II Channel. Building on the Silk mode found in the Portico Series mic pre-amplifiers, Texture is designed to adjust the actual amount of harmonic music content from the source material, in effect, providing wide range of tonal options for the preamplifier. With the 511, the Texture control allows these techniques to be pushed further than previous designs, adding about 10 times the desirable THD of the original silk control at the maximum setting. With that said, we have taken great care to ensure that the musical integrity of source material itself will not be compromised by these harmonic controls (these are not to be confused with controls from other manufactures that may incinerate, demolish or destroy source material), and we believe they can be confidently modified to fit the personality of any song, instrument or engineer. Low Noise, Low Distortion Operation. Much care was given in designing the 511 to produce as little noise and non-harmonic distortion as possible. Carefully implemented signal paths and Class A operation are a large part of the 511s sweet, whisper quiet performance. A complete discussion on transformers is out of place at this point, but it is helpful to review some of the essentials where it will be seen that a design needs to be viewed as a whole, not simply from the point of view of a single component. The fine subtleties of circuit design relating to sonic performance are gradually becoming more clearly understood. For example, research has shown conclusively that frequencies above 20 kHz affect the way in which humans perceive sound quality. But, long before scientific evidence emerged a substantial body of musicians and engineers knew that equipment with apparently the same technical measurements could sound very different. Incredibly small amounts of musically dissonant odd harmonics have a disastrous effect on the sound quality. Extraneous noise or interference that finds its way into a signal path seriously impairs performance of the whole chain. Many control rooms make use of outboard gear that is not well protected from external signals. Poor grounding of such equipment can be a serious problem. Electronically balanced circuits much used in modern equipment, can give very good measurements on the test bench but they do not provide adequate rejection of the stray fields found in every working environment. Input and output circuits must be freed from ground dependence so that only the wanted signal enters and leaves the processing path. Transformers are the ideal solution. The sweet and silky sound of my classic old favorite consoles was achieved with big transistors and large high quality transformers. This is one of the reasons we use transformers. A 12-way precision rotary switch controls gain from 0 to 66 dB in 6 dB steps. Continuously variable +/-6 dB level control. Engages phantom power on the microphone input, as supplied by the 500 series rack. Push button inverts the polarity of the signal path, and illuminates when engaged. The symbol Ø is often used to denote opposite polarity. The high pass filter is continuously variable from 20-250Hz and engaged by the HPF switch, which illuminates when engaged. It is a valuable aid in any signal chain, but particularly so in a microphone preamplifier. Red Silk accentuates the saturation in the mid and high frequencies, similar to that of the red silk mode on the Portico II Channel. By manipulating the Texture control, the amount of Silk can be changed from essentially absent, to roughly 10 times the amount of coloration / distortion found in Silk from the original Portico Series. With Silk / Texture engaged, the distortion characteristic and harmonic content of the unit are very reminiscent of many of Ruperts class-A vintage designs. An Eight-segment LED bar-graph meter displays output level (pre-Silk). The color range proceeds from green for lower level signals, yellow for intermediate signals, and red for high levels. When the 511 is clipped, the highest red LED will hold longer depending on how far above the clip threshold the signal was. 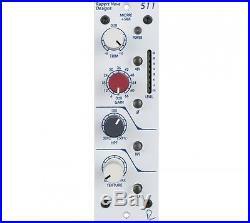 The item "Rupert Neve Designs Portico 511 Mic Pre with Silk" is in sale since Thursday, November 03, 2016. This item is in the category "Musical Instruments & Gear\Pro Audio Equipment\Preamps & Channel Strips".